I honestly can not wait for autumn to kick in, mainly because it’s too hot to do anything most of the time, but also because autumn/winter fashion is better than chocolate(most of the time). Last year I rekindled my love for jeans, and denim in general really. I remember back in February/March time I posted many style boards with slouchy jeans and midi heels/court shoes but I think it’ll deffo be a look that i’ll rock this season. I really think it’s a perfect combo for smart/casual, i’m using a lot of forward slashes today aren’t I? This pair in particular will set you back about £73 and you can order them right here. Oh and the court shoes? ASOS of course! £25 and they’re yours. I decided to pair these jeans with this beautiful kimono/blazer combo. I found it on the Vero Moda website whilst actually looking for a handbag, i’m easily distracted, oops? A loose fit which I think makes it more of a casual item, but still interesting enough to be able to dress up a pair of jeans. I’m loving blue at the moment, all shades! I recently bought a large baby blue blazer from Dorothy Perkins in the sale and I can’t wait to style it for the blog! Right off the track there but anyway, I think this kimono/blazer combo is a perfect autumn/winter piece for this year! It’s available for around £30. Last but not least is this amazing clutch(I think it’s actually a make up bag but shh) bag from a little etsy store called BreakUpsToMakeUp. They’ve got loads of really awesome products, I highly suggest checking them out! “Love raised me, lipstick saved me” I think it’s a sin if I don’t purchase this right? Treat yourself to one too, it’s only around £20, score! Overall, I think this is such a simple yet stylish outfit, at this rate i’ll have ordered every single item before the day’s up! Are you loving this look as much as I am? Are you excited for autumn/winter? Let me know! I hope everyone’s had a fantastic weekend! 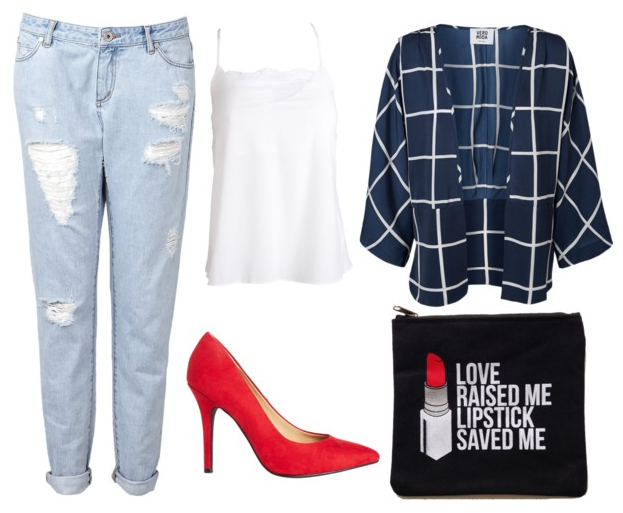 That lipstick clutch is such an amazing find! Thanks for this gorgeous inspiration! I NEED that clutch bag in my life it is amazing!